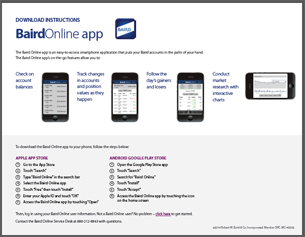 Need to access your Baird Online account on the go? Learn more about how to stay connected using the Baird Online app. Not a Baird Online user? No problem – get started here or contact the Baird Online Service Desk at 888-212-8843 with questions.